There are many different types of gambling and for most people they are not a problem. However, for some people gambling can become an addiction, for these people, whatever the form the gambling takes, whether it involves cards, poker machines, horses, lotto tickets, or any other type of gambling, there are certain common patterns of motivation and behaviour. The following material is a brief examination of why people gamble! What were you thinking just before the idea of gambling started to occupy your thoughts? Were you in an area where gambling takes place, or elsewhere? If elsewhere what encouraged your thoughts about gambling? Why did the gambling stop? Was it control or lack of money? That by winning a few small amounts they are on a winning streak and the jackpot will soon follow. The fact is that, although gamblers dream about having some special talents or "good-luck" these are simply delusions. Even if they do occasionally collect, the winning margins, whether on the horses, poker machines, blackjack, etc. are very carefully calculated so that the house is the only winner. The idea that if a person sits at a poker machine for a long enough time the machine eventually has to make a payout, or give a reward for their effort, is irrational thinking. For instance, it has been calculated that some poker machines would have to be played at least eight hours a day for over twenty years before they pay out a single jackpot. The idea of being on a winning streak and it is only a matter of time before the jackpot comes up, is a dream rather than a reality. Gamblers believe that, because there are few small wins the big prize has to soon follow, however the machines are designed to pay out that way. The manufacturers understand that small wins reinforce the gamblers belief that winning is possible and that encourages them to keep trying. Another common fallacy of gamblers is to recall their wins and forget their losses. They will recall how they previously won $1000 and "how easy it was to win", forgetting that they probably outlaid $10,000 to win that $ 1,000. It is part of human behaviour to remember our successes and forget our failures, and gamblers are the very worst users of this form of rationalization. Not only do they forget they spent $10,000 to win $1,000 but also they forget that their winnings plus other money was also lost and that they ended up broke. Gamblers will usually promise themselves they will only spend $20 and then walk away. In fact the $20 becomes $30, $50, then $100, as they remain certain that the very next $1 has to be the winning dollar. REBUILDING A LIFE WITHOUT GAMBLING. No one is ever born a gambler; like so many other habits gambling is a form of behaviour that is learned. Over time habits tend to be formed because they give positive emotional stimulation. This influences the way that people think and then behaviours form to maintain the emotional stimulations. Often the behaviour acts as a reward, relieving stress or boredom. Sometimes the behaviour is triggered by greed, or as an act of defiance, a secret way of getting back at a spouse; there are as many reasons why people gamble as there are gamblers. Just as gambling habits generally develop gradually, so too does the gambler behaviour need to he gradually replaced. As part of this process there is a need to exchange the gambling for something else, to avoid leaving a vacuum in the gambler’s life. Gamblers had a life before the habit became an obsession and compulsion. The gambler must decide what they really want out of life! Personal motivation is essential. No one else can do it for them; no one else can make another person gamble and no one else can make them stop gambling. In our society, at the present time, poker machines have become the most popular form of gambling; there are a number of underlying reasons for this, reasons that few poker machine players understand. In an attempt to explain some of the hidden drives that encourage gambling addiction, we will use poker machines as an example of how gamblers are manipulated. The environment of poker machine parlours has been carefully designed to attract and hold customers, especially gamblers. They are like cocoons. Because there are no windows the outside world is completely shut out, removing any possible external stimulation. They do not have clocks so that people lose track of time. They have people there to help players spend money; they provide free tokens to get players started, free coffee and tea, cheap meals. All add to the gambler’s feelings that they are in a caring environment, with real friends who want to help and care for them. For the bored they offer the excitement of the noise and the flashing lights, all designed to stimulate you, get you excited, so that you stop thinking rationally. The lights, color, sounds are all part of the tender trap. The facts are that the bigger the prize they offer, the greater are the losses. There are no free lunches; all the free gifts are given because the operators know that for every dollar they give away they get thousands back as profit! Sometimes the gambling starts as a means of escaping from personal or domestic problems. However, gambling usually makes matters worse; it adds to the problems, especially the financial problems. Gambling is an insidious trap; it is not the means to freedom. Personality Assessments: These are often described as "pen and paper" assessments. There are long established questionnaires which can help identify personality profiles, locate strengths and resources as well as being able to locate weaknesses. They provide useful information to allow a plan of action to he developed. Cognitive Behavioural Therapy: A practical step by step way to unravel thought patterns and replace the negative thinking and behaviour with a more-positive constructive way. This in turn can lead to new ways of coping with life events. Habits commence with thoughts and emotions. These in turn shape behaviour. CBT allows the person to gain insights into their irrational thought patterns, and enables them to rediscover thought pattern that can help change the behaviour. It allows the person to regain control. Behaviour Modification: A conscious planned approach to changing habits or behaviours. Though a person may have tried to change unwanted habits by choice or will power these often fail. Success is more likely with a behaviour modification planned approach. Relaxation Training is a step towards regaining control over thoughts and actions. Thought blocking: Thoughts are a form of internalized communication; often the more the attention focuses on a problem the more it becomes an obsession. Trying not to think or behave in a manner often leads to the inability to resist. Hypnosis: This can be a useful part of management of many habits. It can assist in locating issues, identifying resources and reshaping behaviors. Self-hypnosis: Though all hypnosis is actually self hypnosis, this process allows the user to create patterns of self management and self control. Self-hypnosis can be used as a choice and can assist the individual to be more in control of their life. Bio-feedback: The mind is constantly active. For some, a lot of this activity is fear, worry and concern. These thoughts can cause stress and that stress can he measured simply by a finger tip measuring device. It allows the person to actually see and hear how the body is responding to thought processes. The person can also see and hear what occurs when those thought patterns are changed. Sound Light Entrainment: A new way of using old methods. It is effective in a way similar to relaxation training, meditation or self hypnosis. 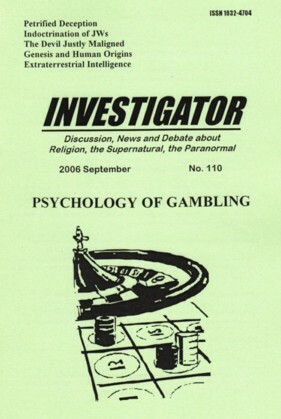 This method uses a carefully balanced state of light and sound combined with guided instructions to discover the origins of the gambling and then develop changes in your behaviour. This form of therapy can also assist other changes, by reducing stress, and helping to develop useful alternative strategies.